In Caught In The Web, we set aside the printed funny books temporarily to delve into the world of digital and web comics. Stewart R: First and foremost, I’m pretty new to the whole digital comics thing; I’ve read a few series on PDF format using my decent sized PC monitor and I’ve looked at just one or two freebies on Comixology using my Android phone in recent months. I find the prospect of using either of these methods flawed for one reason or another - it’s clear that purpose-created digital comics are best suited to the 'tablet' format presently - but I’m still willing to take a look at what is currently out there. Secondly, I’m a big fan of Abnett and Lanning’s run on Guardians of the Galaxy and am a tad skeptical when it comes to Brian Michael Bendis’ 2013 version and where he may take these familiar characters and how he might portray them. 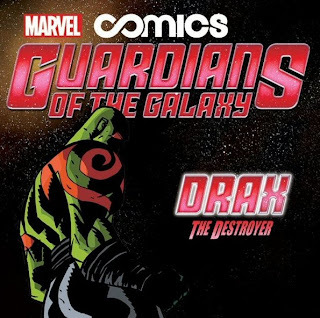 This Infinite Comic effort focuses primarily on the brooding green killing machine known as Drax as he drinks away his troubles on some far flung Rigellian world and runs into less-than-friendly company whilst doing that. It appears that these Infinite comics featuring the Guardians will be used to show how Peter Quill gets ‘the band back together’ so to speak, and they’ll be utilised to quickly demonstrate each team member’s temperament and skill set. That’s actually a sound enough premise that makes me feel a little better after my disdain for the recent 'Point One' Guardians comic that I shelled out for. I know it doesn’t always make for a stable business model, but considering the size and relative wealth of Marvel I do think that they could do with throwing more freebies towards the eager audience like this in order to preview and sell upcoming series. What this opening chapter boils down to is little more than a bar-room scuffle between powerful combatants, yet the way that it’s been delivered in the digital form makes it something of a joy to read. The skirmish really flows from one panel or viewpoint to the next and while Oeming seems to get a lot of credit out there in internetland for the art, I’m guessing that Yves Bigerel’s layouts play a large part in the visual success too! Oeming’s recognisable stylings and the transitions from blow to blow really help this to feel almost like a Genndy Tartakovsky (Samurai Jack, Star Wars: Clone Wars) storyboard comic. 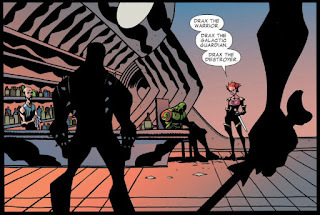 Bendis is once again in sparse-dialogue mode - Drax is rarely a chatterbox anyway - and though his trademark speech bubble back-and-forth is evident in a few places it actually helps to highlight the punchy banter and prickly relationship that Peter and Drax share as the former tries to once again enlist the help of the latter. 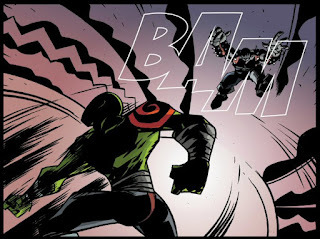 As Drax converses we get a nice repetition of his emotionless facade and it acts as a great balance to the ferocity of his previous physical outburst, the tremendous extremes of this complicated man clear to see within just a few beats.